Hello everybody, Toni here to share a summer inspired canvas. Here in the UK we've actually been enjoying some really good summer weather and it's brought a smile to the nation! I know we tend to go on about the weather but believe me this is the first really warm summer we've had for years. 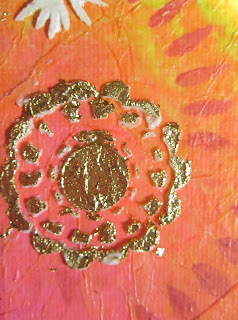 So to celebrate the sun coming out I've produced this canvas using lots of Dylusions inks, some stencilling and a touch of gold leaf for added sparkle. 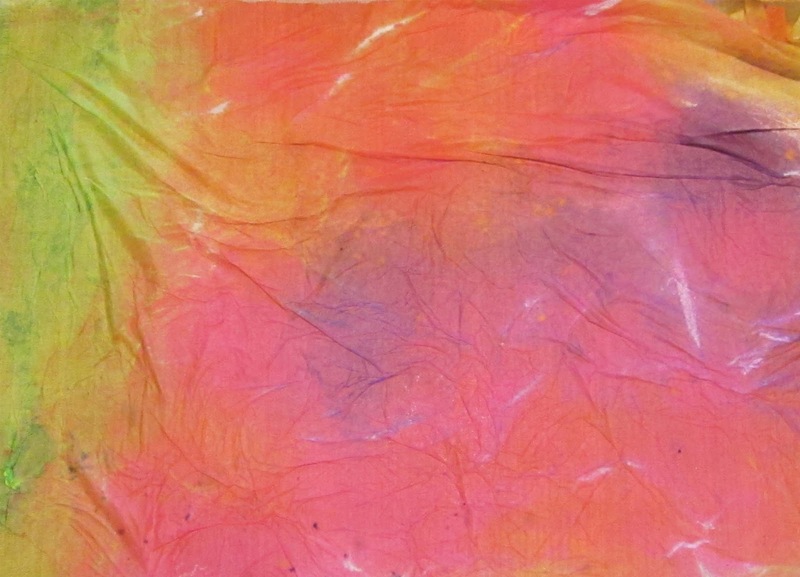 I started out by spraying white tissue paper with a selection of Dylusions inks. This was messy but such good fun ! Once this was dry, I selected a piece big enough to cover a 5 x 7 inch canvas. I used Studio matte Multi Medium to adhere it. I then set to with some stencilling using Distress Paints to create the large flower shape and then Embossing Paste through Claudine Hellmuth's Wall Flowers stencil. I also did some background stencilling with TCW's Tiny Circles. 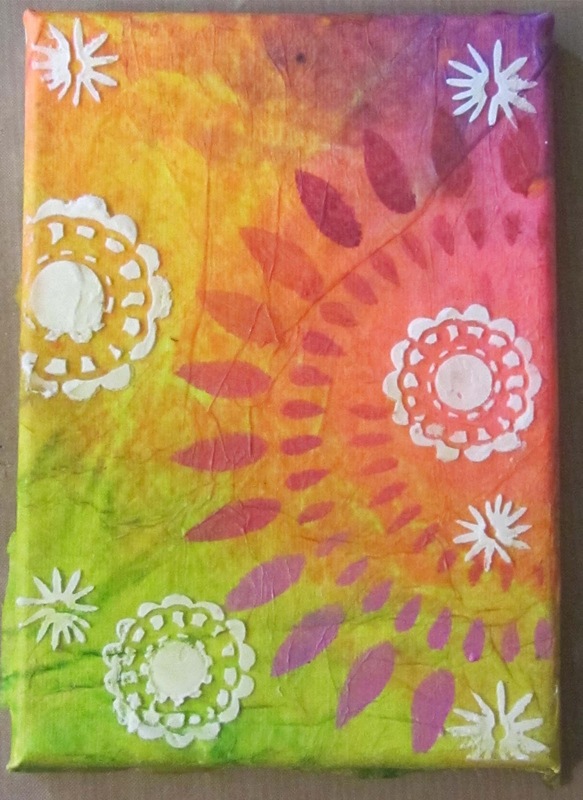 Once the Embossing Paste was dry, I replaced the stencil over each flower shape and dabbed on some 'Flitter Glue' using a small piece of Cut and Dry Foam. This glue is really sticky! 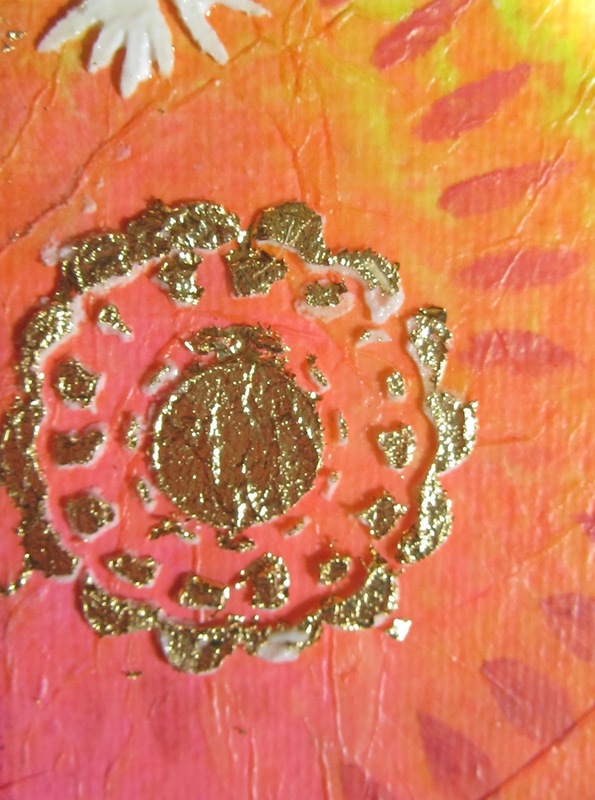 I then applied pieces of gilding leaf in a bright gold colour. 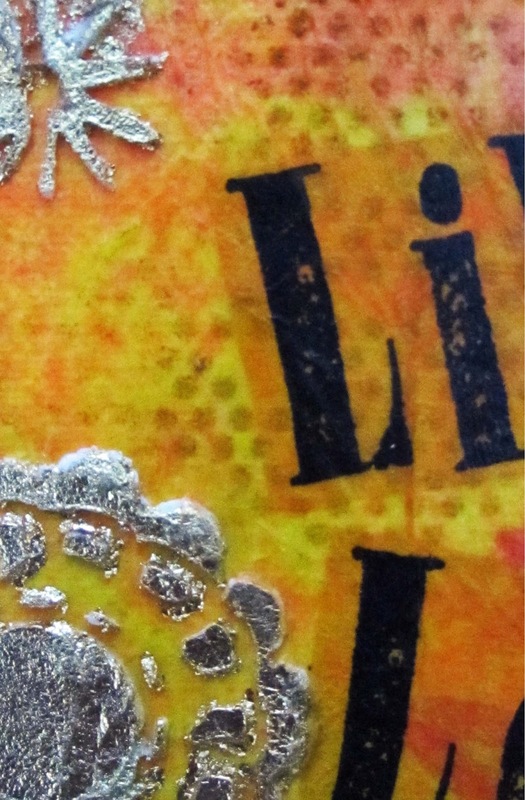 I love a bit of full on bling and I think it goes very well with the hot pink and orange coloured background. It's pretty difficult to apply when your fingers are sticky so I suggest a quick hand washing to remove all traces of glue, before handling the gold leaf sheets. I've used Eberhard Faber Gold leaf for this project. I stamped the words onto some spare pieces of the inky tissue paper, using the Stampers Anonymous Worn Text Stamp set. I love that you get both upper and lower case letters, punctuation and numbers in this set. They are also really easy to line up when stamping a whole word. I adhered the words to the canvas with more Multi Medium. 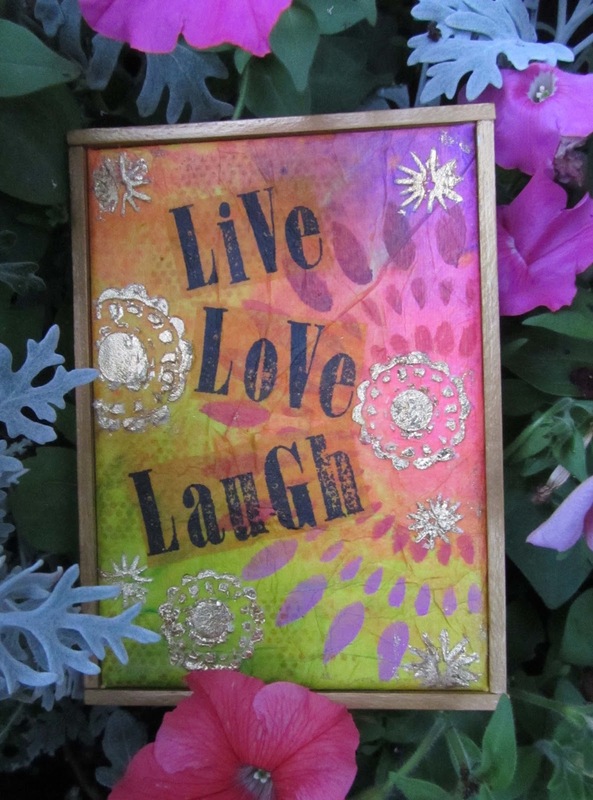 Once the canvas was finished, I took a tip from Claudine Hellmuth's Collage Discovery Book and made a simple wooden frame using balsa wood strips, which I first coated with Inca Gold Paste, before stapling them onto the canvas. I like the way this just finishes it off and contains the image. Here's a list of the supplies I've used available from the lovely eP shop. Don't forget to have a look at all the fab new products Kim has been taking delivery of as well ! Gorgeous colours, and the gilding looks fabulous. Hi Toni...3 of my favourite words to live by..gorrgeous, colorful Art work Toni and yeah at last some warm weather in Scotland. Tonie this is so very pretty - a joy to look at!! Tony you did a fabolous job on this SUMMER canvas. Love the vi rant colors and the words you had chosen. Great idea with the " framing" using Balsa tree. Is that readily avaible in craft stores ? Thanks a lot for sharing your pretty artwork !! , this is a fabulous tribute to summer. The colours are so fresh and yummy and I love the gold leaf highlighting the stencilling. The black lettering provides lovely contrast. It makes me smile.